INTRODUCTION: Tononi has produced half a theory of consciousness. He identifies how recent neuroscience has shown that consciousness is related to parts of the brain on which information convergences. He also grasps that consciousness has to be a fundamental aspect of reality. However, he seems to cling to the idea that it can somehow arise from individual bits of non-conscious information without some additional explanatory feature. Integrated information theory (IIT) is based on the ideas of Giulio Tononi. Consciousness is defined as experience, comprising any experience, such as the experience of shapes, sounds, thoughts, emotions and the self. Consciousness is seen to undeniably exist as an aspect of reality. ‘I experience therefore I am’ is given as a paraphrase of Descartes. Each experience is a unified whole, and is different from any other experience. The experience is from a particular point of view, and unrelated to external observers. Experience contains a large range of informational inputs, but does not involve the superposition of multiple experiences or overlapping experiences. Consciousness is also not part of any more integrated system than itself, and is separate from everything external to the experience. Aggregates, including aggregates of people in groups, are not viewed as conscious because they lack the integration of the unified brain. In order to generate experience, a system must comprise a chain of cause and effects. The information of experience is seen as having a cause-and-effect difference from the underlying information components that make up the experience; moreover, the experience cannot be reduced to these components. Information integrated in this way is called a quale or a subjective experience. Transient attractors are viewed as being functional in the brain. Cortical neurons look to be connected in such a way as to allow the rapid emergence of widely distributed firing patterns of strongly activated neurons over timescales up to hundreds of milliseconds, before dissolving and making way for other firing patterns. These systems involve both long-range and local links. 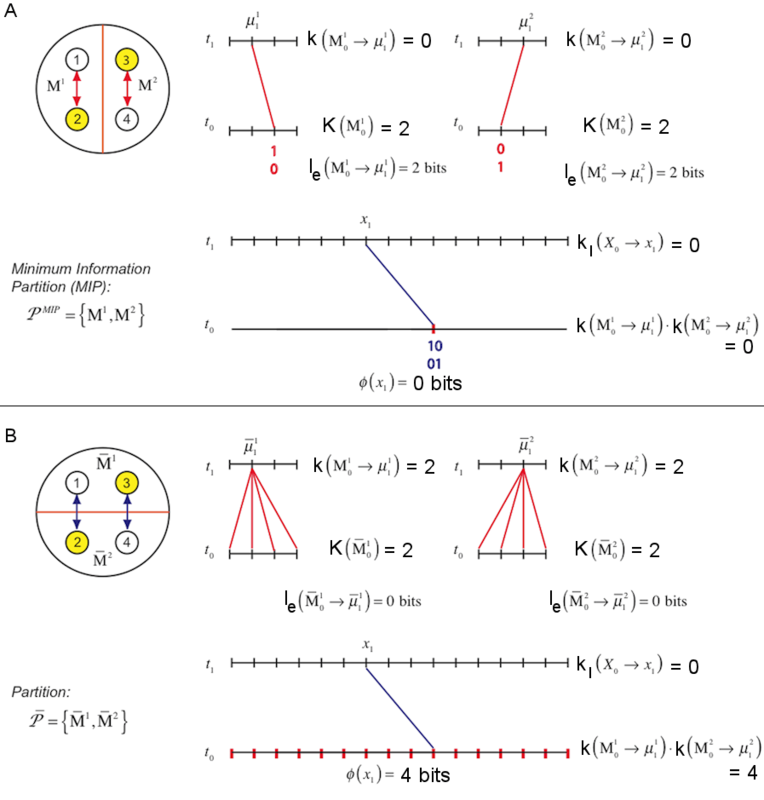 Connectional hubs along the medial surface of the cortex may allow the interaction of spatially separated cortical regions. 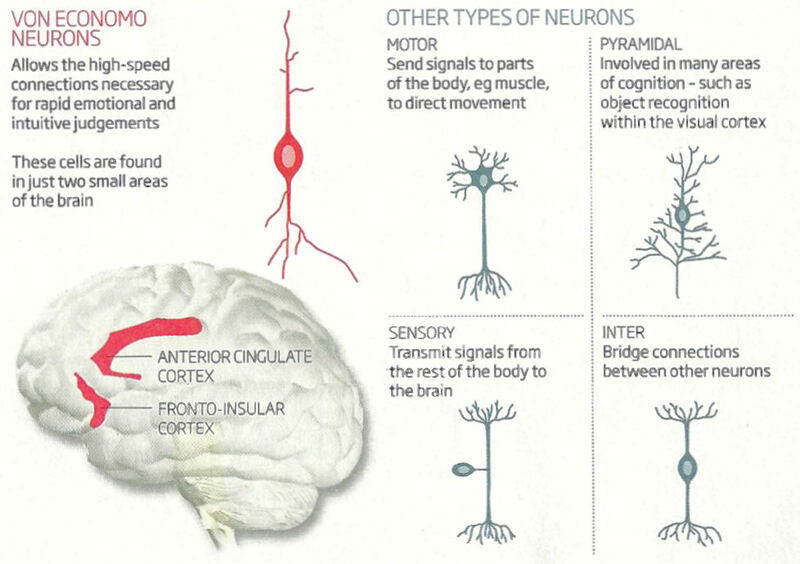 The cortex is very specialised, with groups of neurons and even individual neurons activated by particular inputs. There are also feed-forward and feed-back connections between higher and lower level neurons, so higher level neurons can reinforce the activity of lower level neurons. Consciousness involves a timescale running from a few tens of milliseconds up to two to three whole seconds, and it is most vivid at a timescale of a few hundred milliseconds. Integration of information is argued to require this sort of timescale because the relevant neurons have a wide spatial distribution across the cortex. Thus a particular set of inputs, over a particular timescale produces a maximum integration of information and a locus of consciousness. IIT posits identity between subjective and informational qualities of such systems. Consciousness is related to activity in some parts of the brain, notably parts of the cortex, but is absent from other parts. However, cortical neurons remain active even when consciousness is absent during dreamless sleep. IIT theory involves three thought experiments. The photodiode experiment refers to this device generating one bit of information when it distinguishes between light and dark. It is pointed out that the diode does not have any perception of light and dark, but merely reacts to a signal being in one form rather than another. For the diode, the signal does not have anything like the human visual attributes. The camera experiment comprises the second of these thought experiments. The more extensive information processing of the camera is superficially more akin to the processing of the brain. However, it is argued that the mechanism is not integrated, as is the case for parts of the brain, but is merely a large number of diodes, each performing its own discrimination without communicating with the other diodes. The internet experiment is the third of these thought experiments. The internet is also distinguished from the brain’s processing because it involves point-to-point signalling, rather than full integration of information. By contrast, conscious experience is argued to be ‘maximally integrated’. Each experience is a single whole, and embraces a whole range of information inputs. At any given moment, there is only one consciousness in the brain having one experience, rather than a multitude of overlapping consciousnesses. To be free, a choice must be based on the concept of what is at stake. Thus a choice between right and wrong depends on having notions as to what is right or wrong, which in turn makes certain future or prospective actions right or wrong. The responsibility for actions taken rests on all the neural processing underlying a person’s conscious experience. Choices are a choice of the whole structure, and cannot be reduced to the functioning of any one part of the structure. The idea that conscious choices are an illusion arising from micro-level activities is rejected. Moreover the structure contains a large number of alternative possibilities for actions, confirming the impression of there being a freedom to have acted otherwise than a person actually did. Experiments such as those of Libet where freewill is related to the timing of the flexing of a finger are regarded as ‘shallow’. This is in the sense that the more important decision to participate and cooperate in the experiment have already been taken, leaving only the trivial matter of precisely when, within some reasonable time span, to move a finger. By contrast, life changing decisions will involve a much larger structure within the brain. Integrated information theory (IIT) treats consciousness as a fundamental property of reality, capable of shaping future developments. It is viewed as fundamental in the same way that mass and charge are fundamental. Like the other fundamental properties of the universe, such as mass and charge, consciousness cannot be reduced to any more elementary property. There is an equivalence between consciousness and the local maximum of information, meaning that there is only one consciousness, with certain contents included, and others excluded, and continuing over a particular timescale.